The Firewall component of Comodo Internet Security offers the highest levels of security against inbound and outbound threats. It checks that all network traffic in and out of your computer is legitimate, it stealths your computer's ports against hackers and it blocks malicious software from transmitting your confidential data over the Internet. 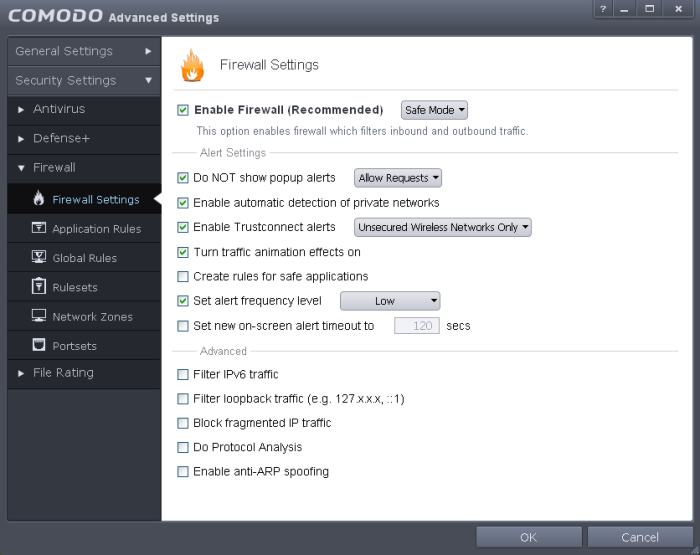 Comodo Firewall also makes it easy for you to specify exactly which applications are allowed to connect to the Internet and immediately warns you when there is suspicious activity. The 'Firewall Settings' area has several sub-sections that allow you to configure overall behavior; configure network zones and portsets and (for advanced users) to configure and deploy traffic filtering rules on an application specific and global basis. Firewall Behavior Settings – Configure settings that govern the overall behavior of the firewall component. Global Rules – View, create and modify rules that apply to all traffic flowing in and out of your computer. Rule Sets – Predefined collections of firewall rules that can be applied, out-of-the-box, to Internet capable applications such as browsers, email clients and FTP clients. Network Zones – A network zone is a named grouping of one or more IP addresses. Once created, you can specify a zone as the target of firewall rule. Portsets - Predefined groups of regularly used ports that can used and reused when creating traffic filtering rules. Background note on rules: Both application rules and global rules are consulted when the firewall is determining whether or not to allow or block a connection attempt. For Outgoing connection attempts, the application rules are consulted first then the global rules. For Incoming connection attempts, the global rules are consulted first then application specific rules.